The 139th Birth Anniversary of Sardar Vallabhbhai Patel as RASHTRIYA EKTA DIWAS (NATIONAL UNITY DAY) was observed on 31st October in VKV, Roing with proper sprit and a good programme was conducted on the day. 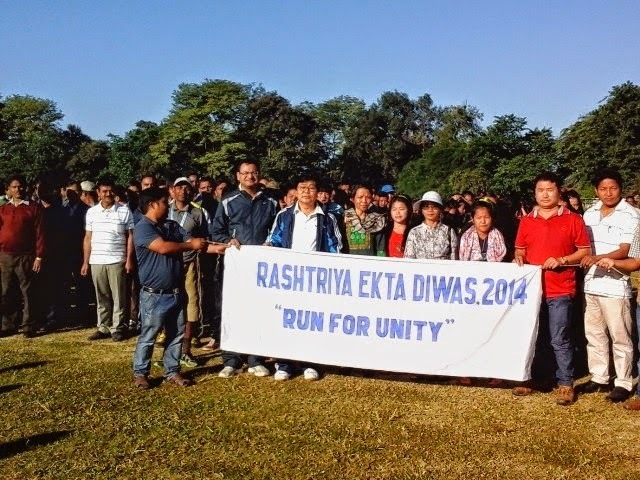 A Marathon “Run for Unity” was organized by the District Administration in the lieu. In which Vivekananda Kendra Vidyalaya, Roing - students, teachers along other schools participated in the “Run for Unity”. Everybody assembled in the General ground at 7. 00 A.M. Honourable Shri Mukut Mithi , MP, Rajya Sabha flagged off the run. Later in the day Principal of DIET, Roing was invited in the school as guest speaker to address the students on the importance of the day, life of Sardar Vallabhbhai Patel and his contribution to the nation. An immense impression was felt by the guest speech upon the assembled. The pledge was led by guest of speaker and the students and teaching staff were also administered pledge to dedicate themselves to preserve the unity, integrity and security of the nation. A drawing competition was held on the following topic “United India”, and Sketch of forgotten fighters of freedom movement.